Small Sample Pack - Griffmusterset "klein"
The small set of samples contains eight pieces of printed fabric (each 7x5cm). Usually we’ll send samples which have no minimum order quantities. For example Pure Cotton, Cotton Classic, Viscose Elastane Jersey, Cotton Sateen, Half Panama Cotton. 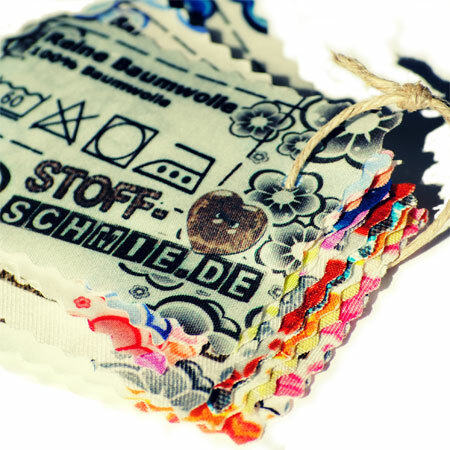 If you require a sample of a particular fabric, please request this when placing your sample pack order. Large Sample Pack - Griffmusterset "groß"
Preorder fabrics - Griffmusterset "Vororder"
Preorder fabrics are printed 4 times a year while stocks last. Beside of this you can easily make ready printed swatches with your own design. We're happy if you try our service directly and create pattern with our designing tool.